To ensure that procurement processes are managed consistently throughout the Agency. This policy applies to the planning, acquisition and management of goods and services including, consulting and professional services. The principles and requirements of this policy apply to all Agency acquisitions other than those specifically excluded within this policy. This policy shall be reviewed as a part of a policy review cycle that occurs at least once every four years. Any exception to this policy shall be justified and documented. For greater clarity on terms used in this document, please refer to Appendix ‘A’ definitions. This policy will be implemented on a phase by phase basis as outlined in Appendix ‘B’. Be accountable for the results of their procurement decisions and the appropriateness of the processes. Be transparent to all stakeholders. Wherever possible, stakeholders must have equal access to information on procurement opportunities, processes and results. Maximize the value they receive from the use of public funds. A value-for-money approach aims to deliver goods and services at the optimum total lifecycle cost. Ensure quality service delivery by obtaining the right product, at the right time, in the right place. Remove inefficiencies by standardizing processes. Purchases under $100 do not require a purchase order/requisition form, but require verbal approval from the appropriate Supervisor as outlined in the procedure “Petty Cash”. Purchases from $100 up to but not including $1,000 shall be obtained through the use of a purchase order/requisition form that is approved by the appropriate Supervisor. Purchases from $1,000 up to but not including $5,000 shall be obtained through the use of a purchase order/requisition form that is approved by the appropriate Director. Note: Regular ongoing expenditures do not require a purchase order/requisition form. Invoices for these expenses must be approved by the appropriate signing authority. These expenditures include but are not limited to: utilities, cell phones, telephones, taxes, legal services, and leases. 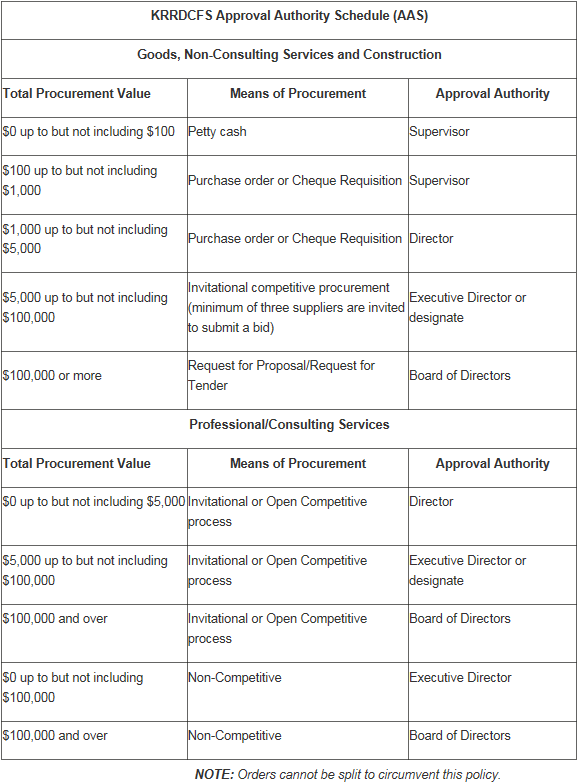 Purchases from $5,000 up to but not including $100,000 must be an invitational competitive procurement process where a minimum of three (3) suppliers are invited to submit a bid. If three quotes are not obtainable, the reason for this shall be clearly documented. Where possible and cost feasible, it is preferable to obtain goods and services from a local vendor. Any valued purchase for professional/consulting services. Dependent on the total procurement value, the appropriate authority approval is required as outlined in the Approval Authority Schedule above. Where results of informal supplier or product research are insufficient, the Agency shall use formal processes such as a Request for Information (RFI) or Request for Expression of Interest (RFEI) if warranted, taking into consideration the time and effort required to conduct them. e) A response to an RFI or RFEI must not be used to pre-qualify a potential supplier and must not influence the chances of the participating suppliers from becoming the successful proponent in any subsequent opportunity. The firms will be required to submit a letter of qualification which responds specifically to the pre-established criteria. All appropriate documentation throughout the selection process will be retained. c) clearly states that submissions that do not meet the mandatory criteria will be disqualified. For open competitive procurements, the procurement document will be made available through an electronic tendering system that is readily available accessible by all. a) The time, date and method of delivery shall be specified in the request document. b) Bids received later than the specified closing time shall be returned unopened to the bidder. c) A bidder who has already submitted a bid may submit a further bid at anytime up to the official closing time and date specified by the request call. The last bid received shall supersede and invalidate all bids previously submitted by that bidder. d) A bidder may withdraw his or her bid at any time up to official closing time by letter bearing his or her signature as in his or her bid submitted to Purchaser. e) All bidders may be requested to supply a list of all subcontractors to be employed on a project. Any changes to the list of subcontractors or addition thereto must be approved by the Purchaser. a) Where bids are received in response to a bid solicitation but exceed budget, are not responsive to the requirement, or do not represent fair market value, a revised solicitation shall be issued in an effort to obtain an acceptable bid unless 8b applies. ii. the Executive Director or authorized designate is able to justify in writing that the changes required to achieve an acceptable bid do not change the general nature of the requirement described in the bid solicitation. c) The method of negotiation shall be those accepted as standard negotiating procedures that employ ethical public procurement practices. d) The Agency has the right to cease negotiations and reject any offer. v. if the above does not break the tie, equal bidders shall draw straws, or be determined by another appropriate documented process. a) In the event only one bid is received in response to a request for tender, the Agency may return the unopened bid to the bidder when, in the opinion of the Executive Director or authorized designate, using criteria, based on the number of bids which might reasonably be expected on a given type of bid, additional bids could be secured. In returning the unopened bid the Agency shall inform the bidder that the Agency may be recalling the tender at a later date. b) In the event that only one bid is received in response to a request for tender, the bid may be opened and evaluated in accordance with the Agency’s usual procedures when, in the opinion of the Executive Director or authorized designate, the bid should be considered by the Agency. If, after evaluation by the Executive Director or authorized designate, the bid is found not to be acceptable, they may follow the procedures set out above under No Acceptable Bid or Equal Bids Received. c) In the event that the bid received is found acceptable, it will be awarded as an Irregular result under ‘Appendix ‘C’. a) For all invitational competitive procurements, the Director of Finance and Administration shall arrange for a review of quotes/tender received based on pre-determined evaluation criteria (depending on product/service) with two (2) additional management staff in attendance at that time. For open competitive procurements, the Director of Finance and Administration shall be responsible for arranging for the public opening of tender bids at the time and date specified by the tender call. The evaluation of bids shall be based on pre-determined evaluation criteria (depending on product/service). There shall be at least two (2) additional management staff in attendance at that time. Note: Individuals involved must declare actual or potential conflicts of interest that may arise as a result of their involvement in the supply chain activities. iii. a recommendation for the award of contract to the submission that received the highest evaluation score and has met all mandatory requirements. c) The authorized signing authority, as outlined in the Approval Authority Schedule, approves or denies the recommendation in writing to the Director of Finance and Administration. a) For procurements of $0 up to but not including $100,000, the Director of Finance and Administration notifies all suppliers by mail. b) For procurements of $100,000 or more, the Director of Finance and Administration will post the contract award notification in the same manner as advertised, following execution of the contractual agreement. The notification will identify the name of the successful supplier, agreement start and end dates, and any extension options. c) For procurements of $100,000 or more, the Agency will inform all unsuccessful suppliers about their entitlement to a debriefing. The unsuccessful suppliers will have 60 calendar days following the date of the contract award notification to request a debriefing. a) The award of contract may be made by way of a formal agreement, Contract Record or Purchase Order. b) A Purchase Order or Contract Record is to be used when the resulting contract is straightforward and will contain the Agency’s standard terms and conditions. that expenses submitted are reimbursed in compliance with the expense guidelines and only where the contract explicitly provides for reimbursement. Iii. the formal agreement shall include appropriate cancellation or termination clauses. d) Where a formal agreement is not required, the Agency shall issue a Contract Record incorporating the terms and conditions relevant to the award of contract. iv. a valid business case has been completed. b) The business case shall be authorized by the Executive Director or the authorized designate and shall include a written explanation as to why the renewal is in the best interest of the Agency and include comment on the market situation and trend. a) No amendment or revision to a contract shall be made unless the amendment is in the best interest of the Agency. b) No amendment that changes the price of a contract shall be agreed to without a corresponding change in requirement or scope of work. c) Amendments to contracts are subject to the identification and availability of sufficient funds in appropriate accounts within the Agency’s approved budget including authorized revisions. d) The Executive Director or authorized designate may authorize amendments to contracts provided that the total amended value of the contract is within the approval authority. e) Where expenditures for the proposed amendment combined with the price of the original contract exceeds the Agency’s approved budget for the project, a report prepared by the Director of Finance and Administration shall be submitted to the Executive Director or authorized designate for approval. a) The Executive Director or authorized designate is authorized to execute formal agreements in the name of the Agency. b) The Agency shall execute Contract Records issued in accordance with these provisions. c) The Agency shall maintain a register of all goods and services contracts, agreements, Vendors of Record valued in excess of $5,000 for which this policy applies. d) The Director of Finance and Administration shall be responsible for the safeguarding of original purchasing and contract documentation for the contracting of goods or services for which the award is made by the delegated authority. e) For reporting and auditing purposes, all documentation, as well as any other pertinent information will be retained in a secure location for a period of seven years. b) The Director of Finance and Administration may prohibit an unsatisfactory supplier from bidding on future Contracts for a period of up to three years. ii. coordinate an appropriate course of action for any non-performance or discrepancies. f) in the event of an “Emergency” where there is an imminent or actual danger to the life, health, or safety of an official or an employee while acting on the Agency’s behalf (e.g. emergency boiler repairs or replacement), an imminent or actual danger of injury to or destruction of real or personal property belonging to the Agency. h) purchases of goods, non-consulting services and construction less than $5,000. Where the non-competitive process is used, rationale must be documented and approved prior to the purchase. ii. a need is anticipated for a range of goods and services for a specific purpose, but the actual demand is not known at the outset, and delivery is to be made when a requirement arises. b) The Agency shall establish and maintain a reference list of approved Vendors of Record to source frequently used goods or services. The reference list will specify Vendors of Record, pricing, discounts from published catalogues, standard pricing, delivery and service policies, etc. c) To establish prices and/or discounts and select sources, the Agency shall employ the provisions contained in this policy for the acquisition of goods, services. d) More than one supplier may be selected where it is in the best interests of the Agency and the bid solicitation allows for more than one. e) When a purchasing action is initiated for frequently used goods or services, it is to be made with the supplier or suppliers listed in the Vendor of Record. f) In a Request for Vendor of Record, the expected quantity of the specified goods or services to be purchased over the time period of the agreement will be as accurate an estimate as practical and be based, to the extent possible, on previous usage adjusted for any known factors that may change usage. The total accumulated value over the length of the agreement must not exceed $100,000. a) The Agency may participate with other government agencies or public authorities in Co-operative Purchasing where it is in the best interests of the Agency to do so. b) The decision to participate in Co-operative Purchasing agreements will be made by either the Executive Director or authorized designate or the Director of Finance and Administration. c) The policies of the government agencies or public authorities calling the co-operative tender are to be the accepted policy for that particular tender. “Accountability” means the obligation of an employee, agent or other person to answer for or be accountable for, work, action or failure to act following delegated authority. “Approval Authority” means the authority delegated by the Organization to a person designated to occupy a position to approve on its behalf one or more procurement functions within the plan-to-pay cycle up to specified dollar limits subject to the applicable legislation, regulations and procedures in effect at such time. “Award” means the notification to a proponent of acceptance of a proposal, quotation or tender that brings a contract into existence. “Bid” means a proposal, quotation or tender submitted in response to a solicitation from a contracting authority. A bid covers the response to any of the three principal methods of soliciting bids, i.e., Request for Proposal, Request for Tender and Request for Quotation. “Bid Protest” means a dispute raised against the methods employed or decisions made by a contracting authority in the administration of a proposal, tender, or quotation process. “Chief Executive Officer” means the head of operations at Organizations. “Competitive Procurement” means a set of procedures for developing a procurement contract through a bidding or proposal process. The intent is to solicit fair, impartial, competitive bids. “Conflict of Interest” means a situation in which financial or other personal considerations have the potential to compromise or bias professional judgment and objectivity. An apparent conflict of interest is one in which a reasonable person would think that the professional’s judgment is likely to be compromised. “Construction” means construction, reconstruction, demolition, repair or renovation of a building, structure or other civil engineering or architectural work and includes site preparation, excavation, drilling, seismic investigation, the supply of products and materials, the supply of equipment and machinery if they are included in and incidental to the construction, and the installation and repair of fixtures of a building, structure or other civil engineering or architectural work, but does not include professional consulting services related to the construction contract unless they are included in the procurement. “Consultant” means a person or entity that under an agreement, other than an employment agreement, provides expert or strategic advice and related services for consideration and decision-making. “Consulting Services” means the provision of expertise or strategic advice that is presented for consideration and decision-making. “Contract” means an obligation, such as an accepted offer, between competent parties upon a legal consideration, to do or abstain from doing some act. It is essential to the creation of a contract that the parties intend that their agreement shall have legal consequences and be legally enforceable. The essential elements of a contract are an offer and an acceptance of that offer; the capacity of the parties to contract; consideration to support the contract; a mutual identity of consent or consensus ad idem; legality of purpose; and sufficient certainty of terms. “Designated broader public sector organization” means an Organization to which section 12 of the Broader Public Sector Accountability Act, 2010 applies. “Electronic Tendering System” means a computer-based system that provides suppliers with access to information related to open competitive procurements. “Evaluation Criteria” means a benchmark, standard or yardstick against which accomplishment, conformance, performance and suitability of an individual, alternative, activity, product or plan is measured to select the best supplier through a competitive process. Criteria may be qualitative or quantitative in nature. “Evaluation Matrix” means a tool allowing the evaluation team to rate supplier proposals based on multiple pre-defined evaluation criteria. “Evaluation Team” means a group of individuals designated/responsible to make award recommendation. The evaluation team would typically include representatives from the Organization and subject matter expert(s). Each member participates to provide business, legal, technical and financial input. “Goods” means moveable property (including the costs of installing, operating, maintaining or manufacturing such moveable property) including raw materials, products, equipment and other physical objects of every kind and description whether in solid, liquid, gaseous or electronic form, unless they are procured as part of a general construction contract. “Goods and Services/Goods or Services” means all goods and/or services including construction, consulting services and information technology. “Organizations” means all organizations listed in Application and Scope, Section 2. “Invitational Competitive Procurement” means any form of requesting a minimum of three (3) qualified suppliers to submit a written proposal in response to the defined requirements outlined by an individual/organization. “Non-discrimination” means fairness in treating suppliers and awarding contracts without prejudice, discrimination or preferred treatment. “Offer” means a promise or a proposal made by one party to another, intending the same to create a legal relationship upon the acceptance of the offer by the other party. “Procurement” means acquisition by any means, including by purchase, rental, lease or conditional sale, of goods or services. “Procurement Card (P-Card)” means an organizational credit card program primarily used for low-cost, non-inventory, non-capital items, such as office supplies. The card allows procurement or field employees to obtain goods and services without going through the requisition and authorization procedure. P-cards may be set up to restrict use to specific purchases with pre-defined suppliers or stores, and offer central billings. “Procurement Policies and Procedures (PPP)” means a framework and mandatory requirements to govern how Organizations conduct sourcing, contracting and purchasing activities, including approval segregation and limits, competitive and non-competitive procurement, conflict of interest and contract awarding. “Procurement Value” means the estimated total financial commitment resulting from procurement, taking into account optional extensions. “Purchase Order (PO)” means a written offer made by a purchaser to a supplier formally stating the terms and conditions of a proposed transaction. “Request for Expressions of Interest (RFEI)” means a document used to gather information on supplier interest in an opportunity or information on supplier capabilities/qualifications. This mechanism may be used when a BPS organization wishes to gain a better understanding of the capacity of the supplier community to provide the services or solutions needed. A response to a RFEI must not pre-qualify a potential supplier and must not influence their chances of being the successful proponent on any subsequent opportunity. “Request for Information (RFI)” means a document issued to potential suppliers to gather general supplier, service or product information. It is a procurement procedure whereby suppliers are provided with a general or preliminary description of a problem or need and are requested to provide information or advice about how to better define the problem or need, or alternative solutions. A response to an RFI must not pre-qualify a potential supplier and must not influence their chances of being the successful proponent on any subsequent opportunity. “Request for Proposal (RFP)” means a document used to request suppliers to supply solutions for the delivery of complex products or services or to provide alternative options or solutions. It is a process that uses predefined evaluation criteria in which price is not the only factor. “Request for Supplier Qualifications (RFSQ)” means a document used to gather information on supplier capabilities and qualifications, with the intention of creating a list of pre-qualified suppliers. This mechanism may be used either to identify qualified candidates in advance of expected future competitions or to narrow the field for an immediate need. Organizations must ensure that the terms and conditions built into the RFSQ contain specific language that disclaims any obligation on the part of the Organization to call on any supplier to provide goods or services as a result of the pre-qualification. “Requisition” means a formal request to obtain goods or services made within an Organization, generally from the end-user to the procurement department. “Segregation of Duties” means a method of process control to manage conflict of interest, the appearance of conflict of interest, and errors or fraud. It restricts the amount of power held by any one individual. It puts a barrier in place to prevent errors or fraud that may be perpetrated by one individual. “Services” means intangible products that do not have a physical presence. No transfer of possession or ownership takes place when services are sold, and they (1) cannot be stored or transported, (2) are instantly perishable, and (3) come into existence at the time they are bought and consumed. “Supplier/Vendor” means any person or organization that, based on an assessment of that person’s or organization’s financial, technical and commercial capacity, is capable of fulfilling the requirements of procurement. “Supply Chain Activities” means all activities whether directly or indirectly related to organizational plan, source, procure, move, and pay processes. “Trade Agreements” means any applicable trade agreement to which Ontario is a signatory. “Supplier Debriefing” means a practice of informing a supplier why their bid was not selected upon completion of the contract award process. The acquisition of goods and services listed above will be processed in full compliance with this policy on or before the dates indicated.